Our guarantee assures you of either a full refund or repair or replacement of the defective materials or workmanship, at the discretion of our Customer Service Department. This is the sole warranty made by Melhart Music. Melhart disclaims all other warranties, including warranties of merchantability and fitness for a particular purpose, as well as all liability for incidental, consequential, special and indirect damage. If you have a claim, call a Customer Service Representative at 1-800-727-2834. If a product return is necessary, your representative will issue a return authorization. This is your sole remedy for of this warranty. Melhart liability for direct damages shall be limited to the amount you paid for the product involved. Melhart reserves the right to make product change without obligation to incorporate such changes into products previously sold. Some states do not allow the exclusion or limitation of damages or warranties, so the above may not apply to you. This is the sole warranty made by Melhart Music. Melhart disclaims all other warranties, including warranties of merchantability and fitness for a particular purpose, as well as all liability for incidental, consequential, special and indirect damage. Our guarantee assures you of either a full refund or repair or replacement of the defective materials or workmanship, at the discretion of our Customer Service Department. This warranty gives you specific legal rights. You may also have other rights, which vary from state to state. For additional information call Melhart Music 800-727-2834. Melhart Ten Year (10) Warranty is valid to the original purchaser. Melhart warrants that the product will be free from defects of workmanship and material from the date of shipment during the Warranty Period, subject to the conditions and limitations set out in this warranty below. Melhart will repair, replace or refund the defective product if the defect id directly a result of manufacture or the materials at the discretion of Melhart Customer Service Department. If you feel like there is a warranty problem with a Melhart Product, please call 1-800-727-2834 or email "[email protected]" and explain the problem. Melhart at its discretion will replace, repair, or issue a return authorization for replacement of a defective product. 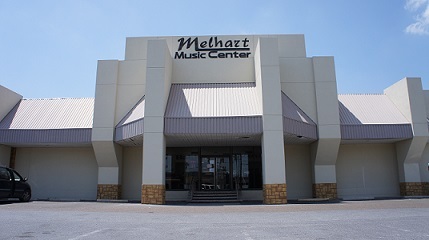 This Warranty applies only to Melhart Music Center Cabinets if manufactured after July, 2015, and remain in the same location where they were first installed. This warranty is the sole and exclusive remedy for any claim against Melhart product purchase. Melhart Makes no other Warranty expressed or implied, as set out in this document except as expressly set out in this warranty document. Melhart expressly disclaims all other warranties including but not limited to implied warranties of fitness or merchantability for a particular purpose. Melhart shall not be liable for any incidental or consequential special or punitive damages or for the loss of profits arising out of the alleged defect or failure of a Melhart Product. Melhart liability shall be limited to the maximum amount that has been paid for the product by the original owner.